Forget Gun Control. How About Guard Dog Control! If you are a home owner or run a business, you are legally permitted to own a vicious dog trained to attack ‘for protection’. As long as the guard dog stays inside the property, there is nothing the authorities can do. 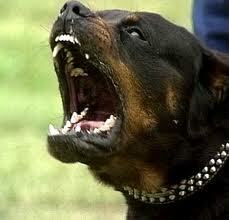 ‘Two Rottweilers that attacked a group of children at Lake Macquarie, mauling an 11-year-old boy, have been destroyed. The boy was walking along a street at Toronto with two girls yesterday afternoon when the two dogs approached and attacked them. These dogs were not trying to injure the boy – or the boy would be dead. The dogs were amusing themselves – hunting in a pack. I have seen this before and it’s terrifying.